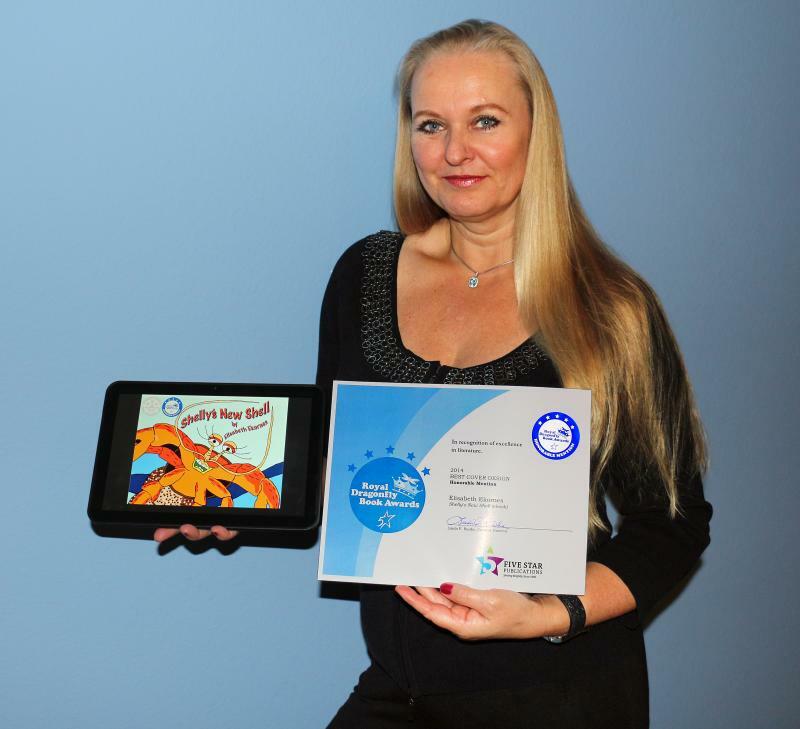 Elisabeth Ekornes is the winner of The Royal Dragonfly Book Award in recognition of excellence in literature: 2014 Best Cover Design, Honorable Mention for her first children's book: "Shelly's New Shell" that she wrote and illustrated. "Winning any place in the Royal Dragonfly Contest is a huge honor, explains Linda Radke, president of Five Star Publications, the sponsor of the Dragonfly Book Awards. "Competition is steep, too, because there is no publication date limit as long as the book is still in print." read this book to their children because the moral of the story will last them a lifetime. This book is fantastic! It has a great message for youngsters and is beautifully illustrated! My niece loved it as well too! Lovely Book. Beautiful illustrations. Very important moral for children to learn. a secondary message to children to leave sea creatures where they belong. Nicely done. 5Shelley's old shell verus the prettier one! time around. Great illustrations as well. The story is sweet and creative with a good message as well. Well done! get enough of the nice colorful illustrations. this to children of all ages. Charming and sweet book! I hope that lots of kids get this book for christmas. My youngest kid loved it! Waiting for more to come. Shelly's New Shell is a delightfully written and beautifully illustrated book for children. I enjoyed this book! It's cute and fun with a good story and nice illustrations. Kids will love it too! Even though my kids are way to old for children's books, we all enjoyed reading this book. the author is able to bring my childhood paradise into a modern expression. The author does a wonderful job in conveying themes of self-esteem and appreciation. illustrations really enhance the work. Recommended! 5Great colorful book with good story! with the story and I highly recommend this book. Shelly tricks Crabby to switch her pink, beautiful shell with Shelly’s humdrum brown. Will this pretty pink shell be the solution to Shelly’s happiness...or are there others who are after the same shell as well? The moral: This book teaches children not to be jealous of other kids, but to be happy with what they have, because they might lose it one day. The Grass is not always greener on the other side. 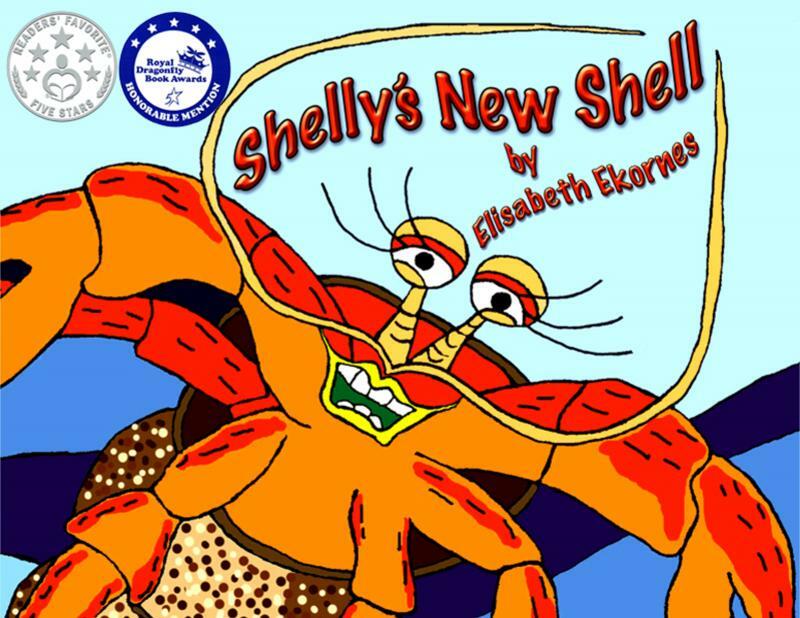 Shelly's New Shell is a children's fable written and illustrated by Elisabeth Ekornes. Shelly is a hermit crab who loves to play in the ocean's waves and has a lot of fun with her hermit crab friends. One day, she looks at Crabelina's shell, which is a pretty pink. Shelly's shell is brown, and she wishes she had a pretty pink shell like Crabelina. Shelly challenges the other hermit crabs to a race and notices that Crabelina is much slower than the rest. Shelly tells Crabelina that she's slower because of her heavy shell, and she offers to trade shells with Crabelina. Crabelina agrees, and Shelly is thrilled with her new pink shell. She's not prepared, however, for the problems she'll have because of that pretty new shell. Elisabeth Ekornes' children's fable, Shelly's New Shell, is a beautifully written story that teaches that someone else's shell, or coat, or hat is not necessarily better than what you've already got. Shelly learns that lesson in a funny and entertaining story. Ekornes also illustrated her book and each picture is marvelous, with brilliant and bold coloring, and comical figures. I especially liked the picture of Shelly in her new pink shell -- she's wearing a huge grin, and her eyes are agleam with delight. My other favorite is the seagull with the glass stuck on its head, but, to be honest, each picture has its charm and is perfectly matched with the story. Shelly's New Shell is a fable that teaches while it entertains, and it does so brilliantly. "This book is original and charming. Elisabeth Ekornes' little fable about a hermit crab that learns 'be careful what you wish for' will appeal to both kids and grown-ups. The text and illustrations are fresh and lively. Quirky and magical, Ekornes has a winner here." “A fun story with beautiful illustrations kids will love.